What started as a lunchtime meeting a few years ago between OWs Peter Chesterton, Keith Towers and Dale Mockford (all 1962-70), has become a twice yearly reunion! 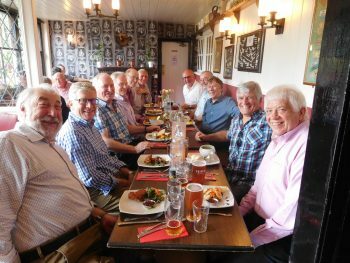 On the 11th July, our latest get-together had grown to 11 old friends & classmates (Rowley Waters gave his apologies on account of spending the day with his mother who was celebrating her 100th birthday!) A great time is always had with much banter and reminiscing. Until now, the Skimmington Castle on Reigate Common has proven a popular venue but with the rapidly increasing numbers, a different hostelry may need to be found for the Winter meeting. Anyone who left the school around 1970 would be most welcome and actively encouraged to come along. If you are interested, please do contact me on 07718 904223. Picture caption (left to right):- Peter Pringle (good friend of OWs), Peter Hieatt, Ed Andrews, Keith Towers, Peter Gale, Sean O’Farrell, Peter Chesterton, Jim Mon, Adrian Figgess, Dale Mockford, Gordon Scott.